We've completed spring planting! Our garden is officially in folks, and boy does it feel good. My three year old toddler, Naomi Rose, helped plant four small boxes that will hold most of the produce I like to can up come late summer. Tomatoes for salsa and spaghetti or pizza sauce. Pickles for Naomi, who is all of a sudden addicted and asks for them before she even has breakfast. Two varieties of of pumpkin, one for pies and the other hopefully appropriate for carving. Peppers, sweet red ones, and spicy Jalapeños. Cauliflower, which is a favourite in our house because of cauliflower tacos. Herbs are spread throughout the yard as I couldn't contain myself to the small bed I had planned to put them in. I've ben amazed at just how helpful my "threenager" has been with all the work that we've completed doing outside, she's shown such interest in the process of planning and planting that I'm proud to see. N. Rose had so much fun digging in the dirt and leaving behind neat (or not so neat) seeds. Our friend Maggie came to help us, she's the inspiration for my garden, and actually built and gave me my raised garden beds for my birthday last September. I have to say they're one of the top five best gifts I've ever received. The friendship I share with my friend Maggie surpasses the kindredness most contain, she's been there for so many big moments in my life and continues to be of such benefit to my little family. From birthday's to seed sowing, Mags has influenced mine and N's reality in some of the most beautiful way, especially when it comes to promoting activities that include Naomi and help focus her energy on creating, something I think gardening does unlike any other activity. In fact, I decided to write a list about it just to prove my point. Showing Naomi that there is a process behind where our food comes from is not only going to give her a platform for valuing it more, but also teaches her that getting fed isn't as quick or easy as just going to the store and picking something out. It takes a long time for lots of the food she enjoys to come to maturity, and even though she is just 3, she's already capable of understanding this concept. You can't funk with the garden and have it still produce right. Mag's and I told N about 5 dozen times not to dig up the seeds after they were planted, and explained how doing so would disrupt their growth and keep them from becoming the beautiful veggies the seed packets showed. As anyone whose ever survived toddler years will tell you, it can be quite chaotic. N is a fiery force to be reckoned with, but usually is capable of great focus when you present her with a interesting project. There are SO many great things she's been able to help with in the garden, from helping to shake the soil out of bags into the beds, to poking her finger into the damp dirt and placing tiny seeds, Naomi got to be incorporated in all of the big parts of planting our garden. Explaining the reasons behind why we plant certain things where has allowed Naomi a example of exercising intention. I love hearing Naomi explain her play to me, which she often does. In a very similar way, gardening creates so many opportunities for me to explain my play to her. 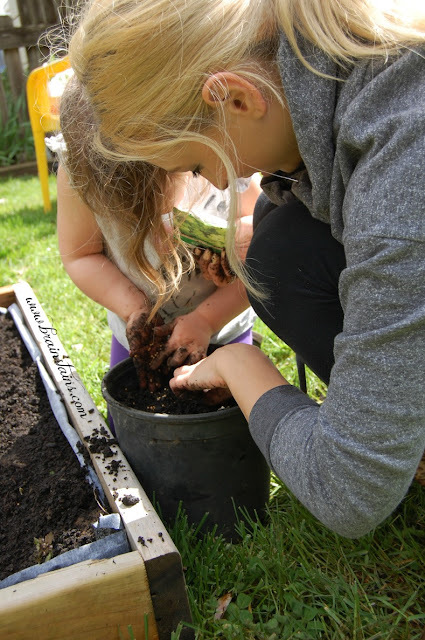 "We plant corn in the back so that the other plants can get enough light" or "You have to plant the carrots and potatoes away from each other so they have enough space" are ways of promoting critical thought behind action, a great thing to exemplify to toddlers. Maggie has been such a great help with our garden, having her here for the day was loads of fun and a great bonding experience. It makes my heart so happy to have Naomi influenced by someone who loves to be outside and create as much, if not more than I do, this is exactly the type of can-do gal I want her to grow up to be. Since we live in a little cottage, entertaining outside is our best bet for a big group, and I hope to have many evenings filled with friends, family, and neighbours for N and I to enjoy. 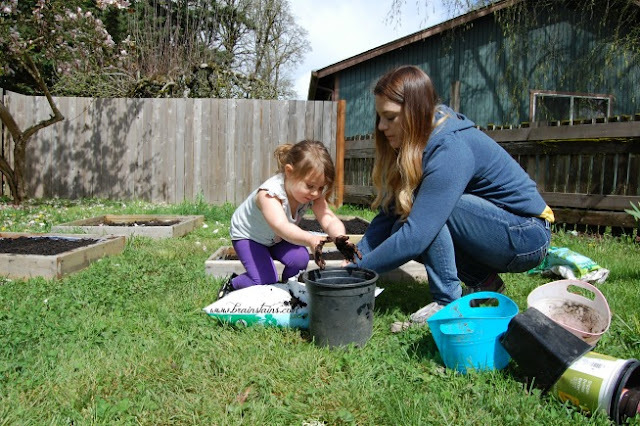 Having a garden to care for is a obvious way to help build consistency and a sense of responsibility in your toddler. I've found indoor chores are quite a bit harder to keep N focused on, mainly because they just aren't as fun as watering or digging in the dirt I suppose. She's always loved being outside, even as a tiny baby she'd love to pull herself up on the tall garden bed at her dad's and "help" mama harvest spinach or strawberries. Going out every day to see what's ripe is something I'm so looking forward too! Being in the garden promotes a state of mind called flow, in which we loose a aspect of conscious thought and loose ourselves in the process of what we are doing. Getting toddlers into a state of flow is surprisingly easy, in fact in my mind, much of what we see as "trouble" that little 3 and 4 year old are getting into, could be for them a state of flow. For example, ripping up a tiny piece of paper, or mixing drinks/food at the table, could all be viewed at as a little simply trying to figure out the world around themselves, they are little scientists learning from experience. Gardening is a great way to allow all the flow a tiny person could desire, in a way that is more constructive and intentional. Re-focusing is so much easier and effective than disciplining after all. I couldn't have put in the garden quite as well all by myself. Having Maggie help me in front of Naomi displays to her that even grown ups need help too. I asked Mags lots of questions and our communication was present the entire time we were planting. Sometimes I asked the same questions twice, Maggie was ever patient and willing to help me. All of this is a great example of team work and promotes a "we" mind set, something toddlers sometimes need to be led to. 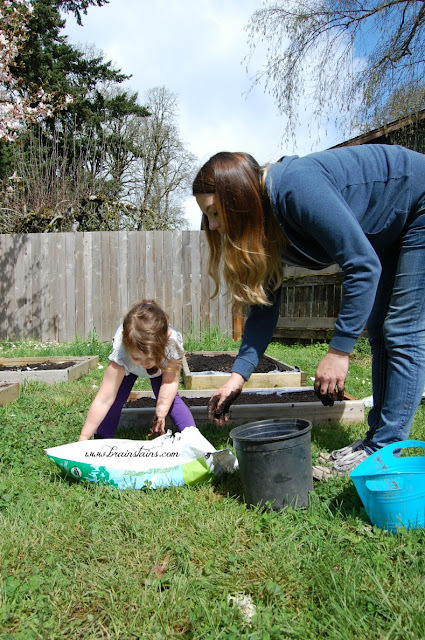 Again, I think gardening allows room for constructive avenues for a toddler to let loose with their creative imaginations, and in a way that is less likely to stress a parent out. N is often showing me little mud pies or "coffee's" that she whips up out on the patio. She tugs me by the arm to come see and I try to oblige her as often as possible, I want her to have fun outside playing, that's what will inspire her to become a adult whose focused on spending time outdoors as well. Almost everything in our garden has been re-purposed. The boards that make up the garden boxes came from Mag's dad's scrap pile. My composter is being made out of a old metal trash can. Old paned windows I asked some guy if I could snag out of the back of his truck at the dump make up the patio decor. I wouldn't have out little yard any other way, re-cycling and re-purposing is my jam, and it makes me proud to show Naomi just what you can do with a little out of the box thinking and investment of time and focus. I can already imagine us sitting out in the chairs around the fire pit I dug the other day, use-able back yard space is one of the most under rated things in my opinion. Nothing really beats having a set up to entertain Naomi in the summer, or being able to sit outside and listen to the birds chirp with my morning coffee. Even though we rent I've found ways to cheaply improve our small space. When we first moved in there was basically nothing besides a big puddle right by the back door where the washer emptied. A fact I only realized after I moved in, of course. The rental company didn't seem to think it was a big deal, though I wasn't thrilled with the prospects of my child playing in yucky grey water each time she wanted to go outside. Luckily I've been blessed by knowing a awesome plumber, who took the afternoon and helped me re-route the grey water into a side flower bed. For about $60 we purchased rocks, pipe, and special glue to complete our project. It took about a hour or two to dig the trench and then to use my grandpa's old drill to make holes in the plastic pipe, shout out to my neighbour Tom who lent us a electric saw! This neighbourhood has been such a haven, so spending a little bit of time and money to improve a place I love so much didn't feel like too high a price to pay, especially considering the outside area right by my door was transformed into a space I could actually use, and have come to love so much. Next step was to do a shotty levelling job (I didn't have very many garden tools at this point) and to spread some sand and then lay down cheap concrete pavers. I remember pulling up to Home Depot in my tiny Honda Fit and having the high school kid who worked there doubt my ability to fit my load of pavers in the back. "Men" I said to the girl working, "if I had a nickel for every time one doubted me and I proved them wrong I wouldn't have to be hauling my own pavers right now." She laughed amicably but I know this is a lesson she has yet to learn to the extent I've come to. There is a certain satisfaction in figuring out problems that seem bigger than ones self. Yes, I've needed a lot of help on my little outside area, and have been lucky enough to have incredible friends who don't mind digging in to get things done, but the passion and large portion of the work in my yard has been done by myself. Looking outside and being able to see the fruits of my labours while watching N. Rose enjoying herself out there gives me more satisfaction than just about anything else in this world. Neighbours, family, and friends have given me a lot of the plants I've used around my home, so there's such a sentimentality to my space that endears it to me even more. My succulents came from Grandma and a Aunt. The flowers on my front porch were a Easter present from my mama, the bushes were left here as a gift from Mags. She even bought my little seedlings for me the other day when N had a typical 3 year old melt down over not receiving the candy she wanted at the check out line and I had to haul her out. It's beautiful how when your intention aligns with a higher intention things fall into place and you receive the help you need without even asking for it. There's nothing like blogging to allow you to reflect on the bigger picture and to help put into perspective just how much you've been blessed with. Sharing my garden is something I'll continue to do, even if it doesn't turn out the way I hope. I can't wait to post about all the inevitable fun we'll be having in our outdoor space this year, we've already spent many gleeful hours in our garden already. Some things on our "To Do" list include a green bean/snap pea teepee, finishing the fire pit, a rodent proof composter, rain barrel, and planting many more beautiful little babies out there. The most important part of gardening to me is having something N and I can be proud of that we built together. If there's anything in your garden you truly cannot live without, or your kid's love, please drop it in the comment box below! Man alive, if spring ever came to northern Wisconsin, I'd be all over this! I know the last two summers we had veggies in our garden and my almost three year old was obsessed with tomatoes and eating them off the vine. It was pretty great. I have similar memories that involve eating snap peas right off the vine. Nothing replaces the intimate connection to the earth that growing your own food does! 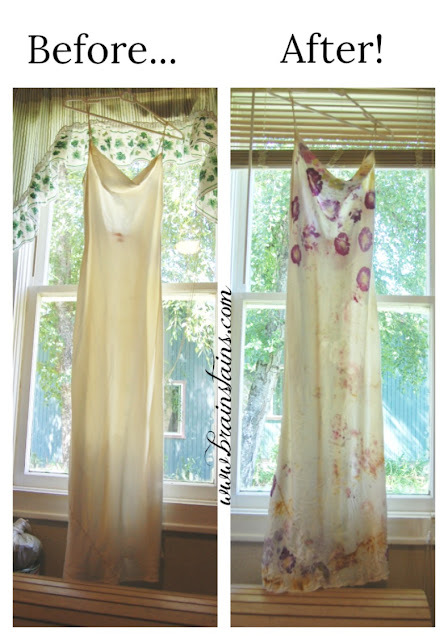 I love the idea of this! What a great way to learn responsibility and have fun together at the same time! She loves to tend the garden! I'm sad to report a bunny came and ate up a couple of our plants though! Good morning people of the internet! Today I bring to your screens a DIY Miranda sings/haters back off birthday cake. If you don't watch Hater's Back Off you should. Hands down best show about a social outcast since Napoleon Dynamite, Miranda, a home school dweeb turned Youtube star because of her sheer cluelessness to how hilarious she actually is, reminds me of myself in ways. Though I have to say the person I think of most when Miranda comes to mind is my friend Maggie's daughter Kate, who I've known since she was about 12 I think. She just turned 15! I've become the unofficial birthday cake maker of my wild gang of hooligans, so I knew Kate needed something that reflected how truly awesome and unique she is for her 15th.